A series of short articles with a North Polar Regions theme . . . The Search for Amundsen . . .
Last Flight . . .
Roald Amundsen prior to the Latham's last flight. Tragically, Lief Dietrichson who was Lincoln Ellsworth's pilot on the 1925 flight to 88�N, also disappeared with Amundsen on this flight. The Latham flying boat in which Roald Amundsen lost his life, in Troms� harbor prior to departing for Spitsbergen to assist in the Italia search and rescue operations. The Latham's Captain, Ren� Guilbaud, had planned to use the Latham in an attempt to fly the Atlantic. Another view of the Latham. Amundsen is at the far right. 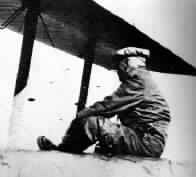 Amundsen was an airplane pilot himself, although he always had other pilots to do the flying on his polar flights. 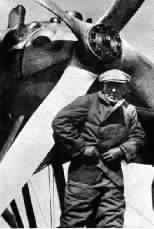 He is pictured above beside the Dornier Wal in which he and Hjalmar Riiser-Larsen flew to 88�N in 1925. Amundsen's pilot license issued by the F.A.I. in 1914. 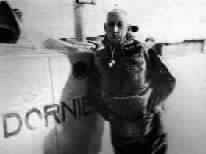 Amundsen held Norwegian pilot license #1. The Search for Amundsen. The often-repeated phrase that Amundsen lost his life searching for his bitter rival Nobile, has a heroic ring but is not entirely accurate. At first, when word reached Oslo that the Italia was long over-due in Kings Bay and presumed down, Amundsen volunteered his services. 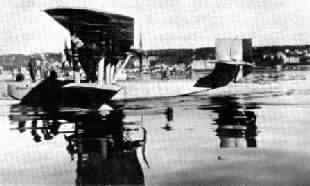 However Italy rejected a Norwegian proposal that the Italian government supply two Dornier Wal flying boats, one of which was to carry Amundsen and to be flown by Hjalmar Riiser-Larsen, Amundsen's pilot on the 1925 flight to 88�N and the second-in-command and navigator on the 1926 Norge flight. 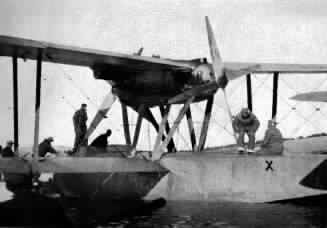 After an unsuccessful attempt to purchase a Dornier Wal in Germany, Amundsen finally obtained the use of a French Latham seaplane and crew. In the meantime, Riiser-Larsen had departed for Spitsbergen to fly a Norwegian Navy Air Force seaplane in the search operations. It is highly unlikely that Amundsen was going solely to the aid of Nobile. By the time Amundsen finally departed Troms� in northern Norway on 18 June bound for Spitsbergen, radio contact had already been established with Italia survivors on the ice floe, their position was known and Nobile was removed on 23 June. A more plausible explanation is that Amundsen intended to search for Italia crewmembers who were left inside the envelope when it floated away and for the missing three-man party that had begun a trek to land from the Red Tent ice floe. One of the three was the renowned Swedish meteorologist Dr. Finn Malmgren who was a veteran not only of the 1926 Norge flight but also of Amundsen's Maud drift in the Arctic Ocean. The ice-breaker Krassin rescued two of the three from a small ice floe on 12 July before proceeding to the Red Tent ice floe, but Malmgren had died earlier under mysterious circumstances on an undetermined date. 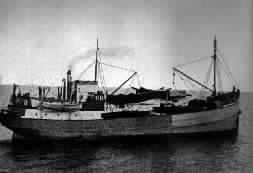 The search for Amundsen and the Latham crew continued throughout the summer of 1928. When world reached Troms� that Amundsen was missing Louise Boyd, who had chartered the Norwegian sealer Hobby for a summer excursion, immediately placed herself and the Hobby and its crew at the disposal of the Norwegian government. Despite an exhaustive search that covered approximately 10,000 miles and ranged from Franz Josef Land in the east to Greenland in the west, Amundsen's remains were never found. Boyd received the Chevalier Cross of the Order of Saint Olav from King Haakon VII of Norway for conducting the search. Boyd went on to lead five more expeditions to the Arctic and in 1954, she chartered an airplane to fly her over the North Pole to become the first woman to travel to the Geographic North Pole. It is now presumed that the Latham went down in fog between Troms� and Bear Island. The Norwegian government officially discontinued the search in September when fishermen found a pontoon later identified as having come from the Latham. On 14 December, 1928, the anniversary of the date Amundsen had reached the South Pole 17 years earlier, Norway observed a national day of mourning for Amundsen and the Latham crew. The sealer Hobby in which Louise Boyd led a search for Amundsen and the Latham crew. 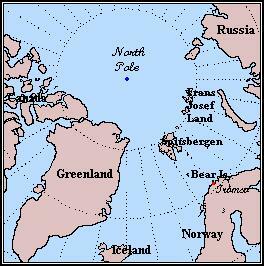 The search ranged from Franz Josef Land in the east to Greenland in the west. It is presumed now that the Latham went down in fog between Troms� and Bear Island.